Greenhill Farm is set in a delightful hamlet situated at the northern end of Otham overlooking the beautiful Len Valley and the North Downs in Kent. The Betts family have farmed in Otham for many generations with David and Caroline Betts managing since 1985. They re-introduced free range Christmas turkeys alongside a mix of other enterprises including supplying chickens for the table. Lambs and horses also graze the fields stretching into the valley below the farmhouse. Every aspect of the farm’s management reflects a strong environmental interest and responsibility, which is evident in all areas of production and delivers the rural harmony that is evident. The turkeys, both traditional white and the recently introduced bronze types, are slow growing varieties reared from birth onwards to exacting standards of welfare incorporating both group and individual care regimes. All the turkeys are free range and therefore have constant free access to green fields and a deep bed of straw on which to lay, taking themselves into the large barn for overnight warmth and security. They are fed on locally sourced grain-based feeds with no artificial additives, but also have the freedom to forage in the grass. Traditional methods of hand plucking, hanging, preparation and also trussing with string are employed to ensure optimum quality. The complete process from the free range environment to the provision of excellent quality food and traditional preparation delivers the enhanced depth of flavour and subtle moist texture that you require. The Christmas turkey flock of this year have all benefitted from a summer of delightful weather taking full advantage of the freedom of being reared outside and, as usual, are looking set to deliver the quality and value that have become expected of Greenhill Christmas Turkeys - The perfect centrepiece for your celebration Christmas meal. David and Caroline look forward to hearing from you soon either by e mail, if you prefer, or simply give us a call to discuss your requirements. We will always respond to your enquiries. 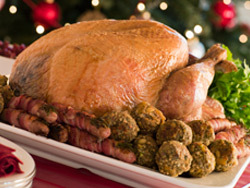 Contact us today to reserve your Turkey for this Christmas. Free range stress- free environment. White and Bronze varieties – all slow growing. Locally sourced grain-based feed with no artificial additives. Traditional hand-trussing method using string. Supplied with or without giblets. Chilled to ensure that your turkey reaches you in perfect condition.